Inclusive and participatory processes for the development of Internet-related policies are essential for a multistakeholder governance approach. Defining modalities acceptable by all stakeholders is one of the main challenges in fullfilling the Tunis Agenda. To help improve processes (described differently in various organizations, but commonly called Policy Development Processes or PDP), it is important to draw lessons from existing methods in organizations such as IETF, W3C, ICANN, ITU and others, that have tested various modalities of involving stakeholders in the agenda-setting, drafting and adoption phases of a PDP workflow.A better common understanding of the different phases of policy development will also facilitate interaction between different organizations dealing with common issues. This workshop will bring together people from various organizations and stakeholder groups with concrete experiences with such processes. Only their combined perspective can provide a clear picture of the progress achieved and the remaining challenges. WHAT IS THE FOCUS ? Agenda-setting:how is discussion conducted on an initial topic suggestion ? What iterations are used to find a formulation of the issue that is satisfactory for all participants ? How is the decision to launch a more formal process taken ? Issue-scoping and framing: how are the different dimensions of the issue and relevant stakeholders identified ? Are initial issues papers or background documents developed? Setting up of working groups:how do different organizations and groups compose them, develop terms of reference, identify convenors, and manage decision-taking and deliverables? A fourth transversal element will be about the corresponding Charters : how are such processes documented ? In what kind of documents are they described ? How are these documents updated ? Chief Communications Officer of Sify Limited, India's pioneer & leader in Internet, Networking and e-Commerce services, and the first Indian Internet company to be listed on the Nasdaq National Market in the US. David is responsible for all aspects of Corporate Communications of the company, as well as the 'Sify' brand in terms of identity and image. He is also involved with Investor Relations for Sify. He brings over 25 years of experience in business management and service & consumer brand marketing with companies such as ITC - Welcomgroup and Mudra Communications. With Mudra, David spearheaded the Marketing Communications of many well-known brands such as Fa range of products in India, Reynolds pens, Henko detergents and many others. Prior to joining Sify, he was General Manager of Mudra Communications in Chennai after a ten-year stint with ITC-Welcomgroup in Marketing. He is qualified in Hotel Management, and has done the MEP at the IIM Ahmedabad, India's premier Business Management School. Network Development Manager for the Association for Progressive Communications (APC), an international networked organisation (established in 1990) that focuses on the use of information and communication technologies by civil society for social justice and development. Karen is a Director of GreenNet, a small non-profit ISP in London, and founding member of APC. In 1993, along with other women colleagues from the APC, she formed the APC Women's Networking Support Programme, which led an all women team of 40 to the UN Fourth World Conference on Women in 1995, where they provided email and web access to over 10,000 delegates. She coordinated the APC WNSP from 1996 to 2004. She coordinated APC's participation in the WSIS process and continues to coordinate APC's participation in post WSIS activities such as the Internet Governance Forum. She is currently a trustee of Privacy International (an international privacy rights and civil liberties watchdog based in the UK), a member of ICANN's Nominating Committee and European At Large Organisation Board. She was a member of the WSIS Working Group on Internet Governance (WGIG) and was awarded the Anita Borg Social Impact Award with the APCWNSP in 2004. President of the Conference of NGOs in consultative relationship with the United Nations (CONGO) since November 2000. Ms. Bloem led CONGO delegations to the World Conference against Racism, the World Summit on Sustainable Development and has been at the forefront of guiding, supporting and coordinating Civil Society in the process of the World Summit of the Information Society (WSIS). Under her leadership, CONGO has gained prominence in the international civil society landscape and became the main counterpart of NGOs within the United Nations. Ms. Bloem has been dynamically engaged in NGO work since 1985. She was actively involved in the drafting of the Convention on the Rights of the Child, (Art. 37d) and, after its adoption, in the promotion of children's rights. As UN Representative for the World Federation of Methodist and Uniting Church Women, she led her delegation to the World Conferences on Human Rights (1993), the Fourth World Conference on Women (1995) and the World Congress against Commercial Sexual Exploitation of Children (1996). Ms. Bloem completed her studies in Medicine, Languages and Literature at the Universities of Bonn, Munich and New York. Program Manager, InfoDev, World Bank. In that function, Valerie dCosta leverages her deep understanding of the challenges and opportunities related to the ICT4D agenda and leads infoDev's efforts to advance the role that ICTs can play in fighting poverty and empowering people. Prior to this post, Valerie most recently served as Director of the International Division at the Info-Communication Development Authority of Singapore - the government agency charged with the development, promotion and regulation of Singapore's ICT sector. In that position, she was responsible for the formulation of the Singapore Government's policies on international ICT issues and oversaw bilateral relations with other countries on ICT issues. Ms. D'Costa has had a distinguished career in private legal practice and in government service. She holds a Bachelor of Laws degree from the National University of Singapore and a Master of Laws degree from University College, University of London. Associate Chair of the World Wide Web Consortium (W3C), the international "standardization" body for the Web, which is based at MIT, ERCIM in Europe/Africa, and Keio in Pacific. As Director of International Relations and Offices, he manages W3C's liaisons (e.g. with ICANN, IGF, ISO/JTC1, etc), and the W3C Wordwide Offices program. Daniel joined the W3C team in Sophia-Antipolis, France, in July 1996. In 1997, he launched the Web Accessibility Initiative and was the Technical Director of the activity till 2003. From 2000 to 2005, Daniel was W3C Europe operational Director. Prior to joining W3C, from 1990 to 1996, Daniel was working in Cambridge, USA, as a software designer and programmer for the X Window System Consortium and before that the OSF/TheOpenGroup. From 1986 to 1990, he was a Unix/Graphics engineer at the Bull Research Center in France. Daniel holds a Ph.D. in Computer Science in Digital Typography and Networking from the University of Nice Sophia Antipolis (1989). Adjunct professor at LuleÂ University of Technology (LTU) in Sweden. Avri also works part time as a consultant to the IGF Secretariat at the UN, as an independent consultant and as an associate with Interisle consulting. Ms. Doria, has been an Internet technologist involved in the development of Internet protocols and architectures for over 25 years, an active participant in the IETF, past chair of the IRTF Routing Research group, and Senior Fellow and past Technical Committee Chair of the Multi Service Forum. She has also been active in Internet Governance for the past 5 years, is currently chair of the ICANN GNSO Council, was an active participant in WSIS and post WSIS civil society, is a past chair of the Civil Society Internet Governance Caucus and was a member of the Working Group on Internet Governance (WGIG). Ms Doria is a also a member of the APC Women's Networking Support Program. Her current projects include research into methods of bringing the Internet into areas that are communication challenged and is working with the semi-nomadic Sámi population of Sapmi (aka Lapland) to develop an ICT infrastructure for the UNESCO heritage region of Laponia. Another current project involves creating a graduate curriculum in Internet Governance at LTU. Ms. Doria has one MA from the University of Chicago in Philosophy and one from Rhode Island College in Counseling Psychology. National Secretary for Information Technology Policy in the Ministry for Science and Technology of Brazil. Augusto is also the Coordinator of CGI.br, the Internet Steering Committee for Brazil (.br domain). He was a Full Researcher at the National Laboratory for Scientific Computing, Brazil, where he was the Deputy Director and Head of the Research Department for a period of 12 years until 1997. Currently on leave as an Associate Professor at the Federal University of Rio de Janeiro. Augusto raduated in Electrical Engineering  Telecommunications in 1971, he received a Ph.D degree in EE, as well as M.Sc. degrees in Engineering-Economic Systems/Management Science & Engineering and in Statistics, from Stanford University. Executive Officer and Vice President - Corporate Affairs, ICANN. Paul has over 25 years experience at the most senior levels of the government, business and non-government sectors. At ICANN he is responsible for communications (which encompasses media relations and public participation), meetings, and website development. Prior to joining ICANN, Paul was General Manager, Operations and Corporate Affairs at Bilfinger Berger Australia, a German-owned holding company in the infrastructure, building and services sector with a turnover of almost $2.5 billion and over 5000 staff. He has also worked as a corporate affairs manager for Telstra Corporation, a leading telecommunications and information technology provider in the Asia Pacific region. Paul has substantial public sector policy experience having been a Chief of Staff to Government Ministers in portfolios as diverse as Health, Urban Affairs and Planning, Housing, Social Security, Higher Education, Employment Services, Water, Infrastructure and Natural Resources. He has worked at the Australian Human Rights Commission on the introduction of Tax File Number and Privacy legislation, and has worked in the education and youth policy sectors. Paul holds a Bachelor of Arts from Macquarie University and is an Honorary Associate at the Graduate School of Government at the University of Sydney. Senior Director, Strategic Technology Policy at Cisco Systems. Arthur is Ciscos principal representative to the International Telecommunications Union (ITU) and other UN activities on policy matters and a member of the Executive Board of the ITU Connect the World program and the Board of the US ITU Association. He has led national, regional, and global efforts to promote open, voluntary, private-sector-led, market-driven standardization and to harmonize standards development. From 1984 to 1996, he held various leadership positions, including Chairman in the ANSI-accredited telecommunications networks standards committee sponsored by the Alliance for Telecommunications Industry Solutions (ATIS). He was an architect of the Global Standards Collaboration (GSC) process that began in 1990, and served as the Vice Chair of the 2007 GSC. He has represented the US IT and telecommunications industry in annual US-China workshops on technology standards and served as a member of US delegations to many global conferences on the use of ICT to promote human, economic and social development. As the business Vice Chair of the UN ICT Task Force, he provided leadership in promoting the achievement of the UN Millennium Declaration Goals through the use of information technology. He is currently a member of the Strategy Council for the UN Global Alliance for ICT and Development (GAID). Reilly was a private sector leader in preparations for the World Summit on the Information Society (WSIS). He is currently active in private sector planning via the International Chamber of Commerces (ICC) Business Action to Support the Information Society (BASIS) for the 2007 Internet Governance Forum (IGF). He is also active in the US affiliate of the ICC: the US Council on International Business (USCIB). His awards include: 2000 American National Standards Institutes Richard Finegan medal for extraordinary leadership in the development and application of voluntary standards. In 2004, the IEEE presented him the Communications Quality and Reliability Presidents Award. In 2006, he was the inaugural recipient of the ATIS Presidents Award. He was nominated to a 6-year term on the US National Science Board in 2006 and confirmed by the Senate. Mr. Reilly has a Bachelor of Science degree in Electrical Engineering from Virginia Polytechnic Institute and a Master of Engineering degree from Cornell University. Coordinator of Information Society issues at OFCOM's international affairs service of the Federal Office of Communications (OFCOM), the Swiss regulatory body for Telecommunication and Audiovisual Media. On behalf of Marc Furrer, former state secretary for the Host Country of WSIS 2003 in Geneva, Thomas was coordinating all Swiss actions and positions with regard to both phases of the World Summit on the Information Society. Currently, he is chairing the Group of Specialists on Human Rights in the Information Society of the Steering Committee on Media and the New Communication Services (CDMC) of the Council of Europe and co-chairing the ITU Council Working group on the Study of the participation of all relevant stakeholders in the activities of the ITU related to WSIS. Born in 1972, he studied history and socio-economics at the University of Zürich. Special Envoy for the Information Society in the French Foreign and European Affairs Ministry since 2006. Bertrand also represents the French government in ICANN´s Governmental Advisory Committee, the Internet Governance Forum and the UN Commission on Science and Technology for Development (CSTD). He actively participated as a civil society actor in the World Summit on the Information Society (WSIS) from 2002 to 2005, as co-convenor of the OpenWSIS Initiative and Director of WSIS-Online. 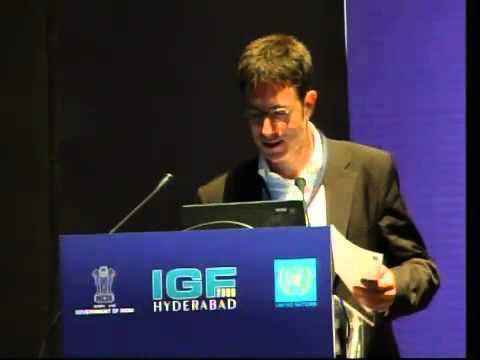 Former Head of the Mission for New Information and Communication Technologies in the French Foreign Ministry (1998 - 2001), he was a member of the G8 Digital Opportunity Task Force (DOT Force) and conducted in 2001-2002 a personnal research on multi-stakeholder mechanisms for global governance at IFRI, the leading French think tank on International Relations. From 1994 to 1998, he was co-founder and President of Virtools, a private company, now an independent subsidiary of leading CAD vendor Dassault Systemes. Previous assignments include advisor to the French Minister for European Affairs. Bertrand de la Chapelle is a graduate of Ecole Polytechnique (1981), Institut d'Etudes Politiques de Paris (1983) and an alumni of Ecole Nationale d'Administration (1986).